La Verniaz is located at the summits of Evian with magnificent views of the Lake Leman. A 5-minute walk from the funicular station dating back to 1907 which leads you to the center of Evian on the edge of the lake. By car you will be 5 minutes from the city center, the thermal baths and Golf Evian, 1 hour from Geneva and Montreux, 15 minutes from the ski resort Thollon Les Mémises. 30 minutes from the medieval village Yvoire. The ferry will take you to Lausanne on the other side of the lake in 35 minutes. In the heart of nature, on the edge of Lake Geneva, near Switzerland, it will take you only 35 minutes from Lausanne by boat, 45 minutes from Geneva and one hour from Annecy to reach this little corner of paradise. 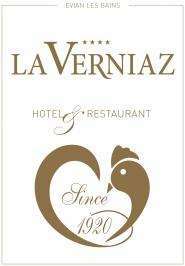 The Hotel La Verniaz is ideally located, whether for your walks in the mountains, at the edge or on Lake Geneva and in neighboring Switzerland. 2km from the pier of the CGN (trip connecting Evian to Lausanne-Ouchy by boat). Evian-Les-Bains train station is 5 minutes away by taxi and Geneva Station is 45 minutes’ drive.